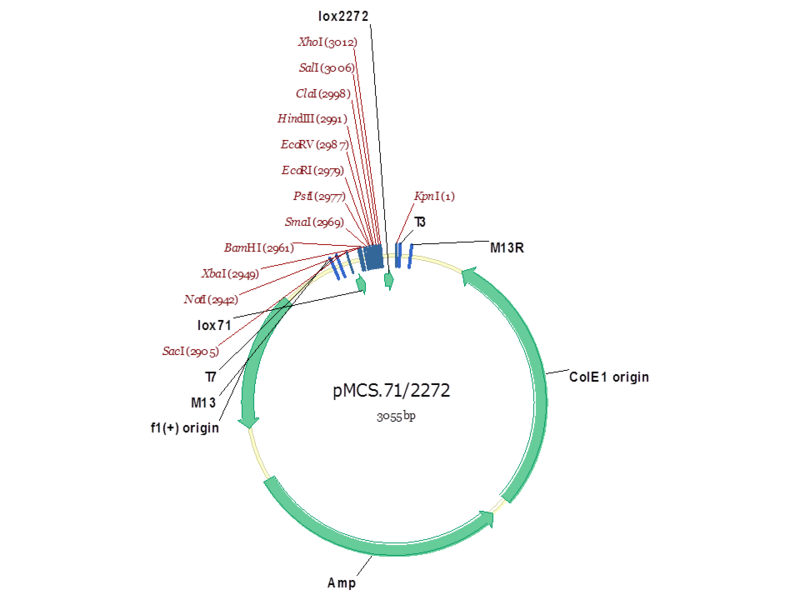 Note: This plasmid was published with different name called pMCS.66.2272. This is a basal exchange vector for RMCE containing heterotypic LoxP sites. A lox71 site, flanked by Sac I and Not I, and a lox2272 site, flanked by Xho I and Kpn I, were inserted into the same sites of pBluescript KS+. Oligonucleotide pairs containing a lox71 site, flanked by Sac I and Not I, and a lox2272 site, flanked by Xho I and Kpn I, were synthesized, kinased, annealed, and ligated into the same sites of pBluescript KS+.